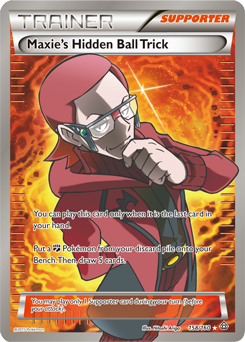 Let’s start with something intriguing: Maxie's Hidden Ball Trick is banned in the Expanded format effective mid-February. Why? There’s new fossil Pokemon in Team Up that would have wreaked havoc in the format. Fortunately, these broken cards aren’t exclusive to Maxie’s Hidden Ball Trick. They evolve from Unidentified Fossil. The Unidentified Fossil is compatible with Rare Candy, so you can get these Stage 2 Pokemon out in reasonable fashion in the Standard format. Flashback to early March 2018, a Rampardos / Talonflame deck had popped up in the metagame. It was strong, and could bead Zoroark-GX decks badly, but suffered from inconsistencies. The fossil archetype lacked Fossil Excavation Map at the time: a key piece of getting set up with a fossil-based deck. None of this has been explored with the game devoid of the right fossil. Fossil Barrier isn’t the perfect solution to crippling an opponent’s setup further, but it’s one that helps a lot against Zoroark-GX decks. Zoroark-GX relies on a large Bench to set up and do significant damage. The Fossil deck, on the other hand, can operate with a smaller Bench and cope. Omastar is potent for that reason and you’ll slow any deck that would give you potential problems. To make sure you can get multiple Stage 2 Pokemon out there’s one new partner: the new Jirachi. Wishing Star will assist you in finding Unidentified Fossil, as can the new Bill's Analysis. Jirachi is your starter, your only starter, much like the Rampardos / Talonflame deck of old. If you only play four Jirachi, you are guaranteed to start with it. Being a Trainer, you can’t lay down the Unidentified Fossil at the beginning of your turn. Playing as many ways to pull the Unidentified Fossil from your deck on your first turn as possible should be the emphasis for this deck. Two Unidentified Fossil in play at the end of your first turn should be your goal, primarily out of fear of your opponent taking a Knock Out on your only one and preventing you from getting the early lock. Jirachi is doubly effective with Escape Board, you can retreat when you’re Asleep. Maybe retreat into another Jirachi, and Wishing Star again to advance your setup. This is your preferred and only starter. You will start with Jirachi every single game. Wishing Star develops and speeds up your setup. Without it you would be significantly more inconsistent and having two of them down at a time is better than one. Two Wishing Star a turn with Escape Board to retreat while Asleep is invaluable. Playing three could be okay, but that means more mulligan cards for your opponent and something you want to avoid.